Stay in the heart of London - after all you re an Urbanite not a tourist. Z TOTTENHAM COURT ROAD has everything you need for a couple of nights in town. Concentrated style an out-of-town price and the West End - at your feet the moment you step out the door. No off-central tourist hotels for you. 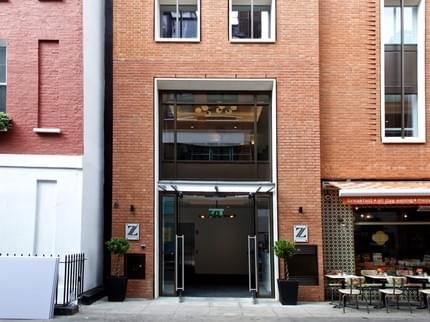 This former office building in the heart of Soho has been transformed to a 121-bedroom hotel with a modern and contemporary style in keeping with Z Hotels ethos of delivering affordable luxury accommodation. The hotel is located in Poland Street within a couple of minutes walk from Tottenham Court Road s new Crossrail station on Oxford Street (opening soon). The property is located 200 metres from Carnaby Street. The property is 400 metres from Queen s Theatre and 400 metres from Old Compton Street. At the hotel the rooms are equipped with a desk. The private bathroom is equipped with a shower free toiletries and a hair dryer. A continental breakfast is served each morning at the property. Staff speak English and Spanish at the 24-hour front desk. Popular points of interest near Z Hotel Tottenham Court Road include Piccadilly Theatre Shaftesbury Avenue and Prince Edward Theatre. The nearest airport is London City Airport 13 km from the accommodation.